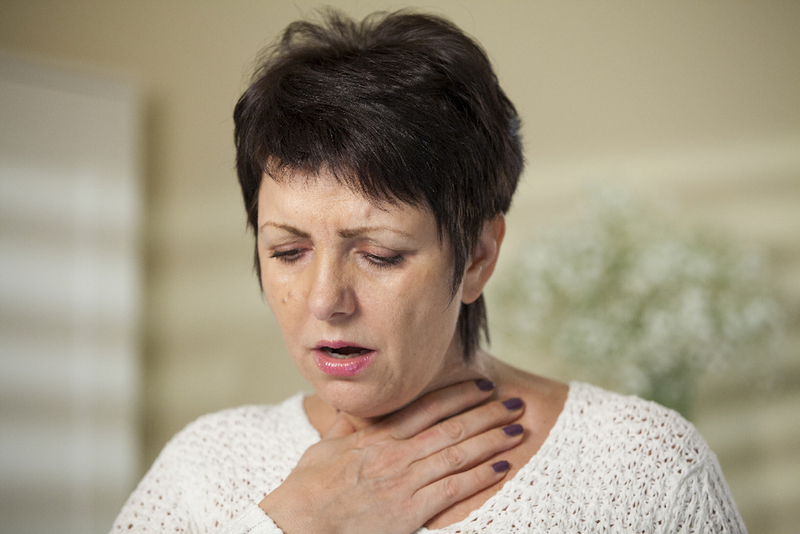 Breathing distress (dyspnoea) can be a symptom of several different diseases. However, there are times when a person’s breathing pattern and/or their sensation of breathing difficulty can be the main cause of their breathing distress. This situation is termed ‘Dysfunctional breathing’. There is no universally agreed definition for dysfunctional breathing, as the condition remains poorly characterised. Inappropriate breathing which is persistent enough to cause symptoms, with no apparent organic cause (Clifton-Smith et al. 2011). Change in the normal biomechanical breathing patterns that result in intermittent or chronic symptoms, which may be both respiratory and non-respiratory. This alteration may be due to structural causes, or much more commonly, be functional ( that is, a disorder of breathing function without an accompanying structural abnormality) (Depiazzi et al. 2016). Dysfunctional breathing may, and often does, coexist with organic lung disease. Conversely, the lack of an organic lung disease to explain breathlessness does not always imply a diagnosis of dysfunctional breathing. A diagnosis of dysfunctional breathing should be made only after exclusion or adequate treatment of any organic disease (Boulding et al. 2016). It is particularly challenging to diagnose dysfunctional breathing in the presence of physiological or structural lung disease. In such cases, dysfunctional breathing may be present if the symptoms are disproportionate to the severity of lung disease. As with the definition, there are also different proposed classifications, with significant overlap between these. 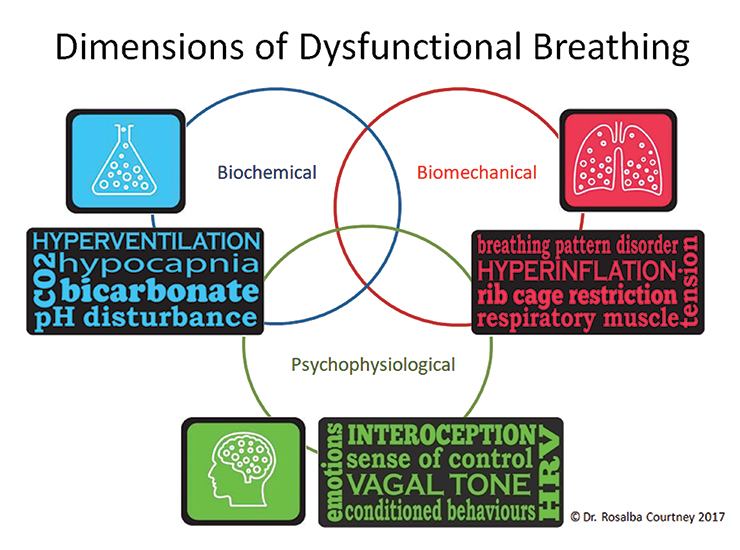 Classifications emphasise the alteration of breathing pattern that can occur with dysfunctional breathing. Further research is needed to clarify the optimal classification for clinical use. A variety of symptoms have been proposed to indicate dysfunctional breathing. These symptoms can be respiratory, symptoms of neuronal excitability, or symptoms of vasoconstriction. The figure ‘Dimensions of Dysfunctional Breathing’ shows the scope of the different changes than can occur with this condition. The problem is complex, having several different dimensions. It is also heterogeneous, since not all dimensions are present in the same person or in all people at the same time. This complexity poses a challenge for the recognition and management of dysfunctional breathing. Used with permission of the author Dr Rosalba Courtney. General practice population: 8% have hyperventilation based on elevated Nijmegen questionnaire results (Thomas et al. 2005). Asthma patients: the percentage of patients with comorbid dysfunctional breathing has been estimated between 29%-80% in different studies (Demeter et al. 1986, Saisch et al. 1996, Thomas et al. 2001, Martínez-Moragón et al. 2005, Grammatopoulou et al. 2014). Difficult asthma: 20% of patients attending a difficult asthma clinic were found to have dysfunctional breathing as a major factor in their illness (Heaney et al. 2005). In an Australian difficult asthma clinic, the prevalence based on an elevated Nijmegen score was 30% (Radhakrishna et al. 2016). The presence of dysfunctional breathing had not been detected by the treating specialist in the majority of these patients (Radhakrishna et al. 2017). Diagnosis incorporates clinical history, physical examination with a focus on observing the pattern of breathing and investigations, including exercise testing in some patients. A common method of assessing dysfunctional breathing includes that administration of the Nijmegen Questionnaire. The questionnaire provides a subjective assessment of “functional respiratory complaints”, which should be complemented with objective assessment (van Dixhoorn et al. 2015). Validated to detect hyperventilation syndrome in a mild-to-moderate asthma population using a modified 11-item questionnaire (Grammatopoulou et al. 2014). Hyperventilation syndrome may be present as one aspect of dysfunctional breathing. This version of the questionnaire has not been validated in children, adolescents or a severe asthma population (Barker et al. 2015). Higher scores found in females, moderate (versus mild) asthma, uncontrolled asthma, breath hold <30s, end-tidal CO2 <35 mmHg (Grammatopoulou et al. 2014). Clinically a Nijmegen cut-off score of >23 is often used to screen for the presence of hyperventilation syndrome amongst adults (Garssen et al. 1984; van Doorn et al. 1983; Vansteenkiste et al. 1991) Grammatopoulou suggests a cut off of >17 (using an 11-item questionnaire) (Grammatopoulou et al. 2014) and Van Dixhoorn ≥19 (van Dixhoorn et al. 2015). Breathing pattern assessment tool (BPAT): a semi-quantitative screening tool that collates data obtained from a respiratory physiotherapy assessment, with demonstrated utility in a severe asthma population (Todd et al. 2018). Field walking test – standardised to assess exercise capacity, breathing pattern with exertion, and evaluate treatment responses (e.g. 6-Minute Walk Test (6MWT)). Breathing retraining is delivered by a qualified professional such as a respiratory physiotherapist (Weiss 1994, Bruton et al. 2011, Jones et al. 2013, Bruton et al. 2018). The aim is to deliver a multicomponent intervention that focuses on normalising the ventilatory pattern at rest and with activity. Specific techniques include the Papworth and the BradCliff methods. Physiotherapy breathing retraining improved quality of life in patients with incompletely controlled asthma, in a recent RCT with over 600 patients (Bruton et al. 2018). More research is needed, as the evidence base is limited (Jones et al. 2013). The following video provides guidance on breathing re-training to optimise breathing patterns in chronic lung disease. The techniques are adapted from Papworth and BradCliff methods. Specific exercises for individual patients should be prescribed by a respiratory physiotherapist. This video has been developed as part of the Bronchiectasis Toolbox and is included with permissions. Dysfunctional breathing is frequent among patients with asthma and should be considered in those with difficult-to-treat asthma, or whose symptoms are disproportionate to the degree of airflow obstruction. Dysfunctional breathing is poorly defined, and difficult to diagnose. No consensus classification exists. Diagnosis relies on a high index of suspicion, and clinical assessment by experienced physiotherapists and physicians. Referral to a specialist centre should be considered if dysfunctional breathing is suspected. Treatment with breathing re-training is often effective.